If you would like an insight into the inner workings of Tata Chemicals Europe, take a look at our latest customer newsletter, in which you will find news about our five-year strategy, and our outlook on things to come this year and beyond. Our Managing Director Martin Ashcroft takes us through TCE's current projects and investments, as well as those to come in the future. Hear also from other employees as they discuss the importance of customer services, quality and integrity. Read about our important work in the community, supportng local schools and charities, including the fundraising challenges we have completed recently. The newsletter also features some interesting facts you never knew about salt solution mining, and our recent successes in making our facilities as safe as can be for our employees. Get up to speed with TCE today. 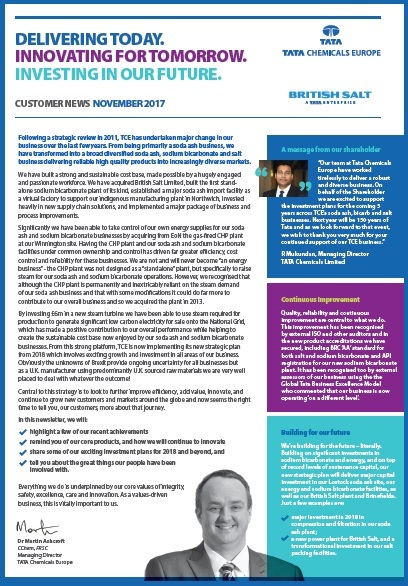 Click here to download a PDF version of our latest newsletter from the end of 2017.